A look at the work created through the Write an Opera course for teachers, Scandinavian style. I love the Royal Opera House: the house itself, the buildings and bustling Covent Garden location. In one respect, however, the Royal Opera House is unfortunately lacking - it does not look out over a serene natural beauty spot. 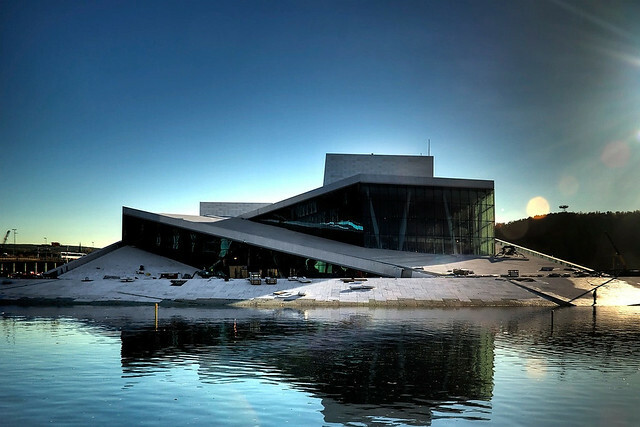 The opposite is true of the Oslo Opera House, home to Den Norske Opera og Ballett. Opened in 2008, the venue isn’t so much by the Oslofjord as emerging from it; sweeping elegantly right out of the water. Imagine my delight, then, when our colleagues from the company's Education Department contacted us about our Write an Opera programme, with an invitation to collaborate on a project at their stunning opera house. This follows our visit closer to home to Gainsborough Primary School to see the result of their projects. Write an Opera is, in a nutshell, a programme that shows teachers on how to create an opera with their students. It begins with a week-long residential course for teachers each summer, equipping participants with the skills, knowledge and resources they need to devise and stage an opera, from scratch with a group of students. Over the years, a number of Norwegian teachers have attended the course and enthusiastically taken the project back to schools across Norway. This summer, a school in Eide, Norway presented its 10th original opera devised and staged by students. In celebration of the anniversary, Den Norske Opera og Ballett invited the school to perform the premiere of its opus no. 10 at the Oslo Opera House itself. Around this momentous event, they curated a weekend of performances, workshops and seminars exploring new opera and the Write an Opera approach. The Royal Opera House’s main role was to deliver a day and a half of practical workshops for teachers, giving participants a flavour of the level 1 Write an Opera course. This presented considerable challenges, as Write an Opera level 1 is usually delivered over the course of a week, comprising no fewer than 66 hours of workshops. We had to find a way to distill this into under 10 hours. To help us on this mission, we drew on the collective expertise of a wonderful team of artists: Rhiannon Newman-Brown (designer), Omar Shahryar (director) and Richard Taylor (composer). And so it was that Rhiannon, Omar, Richard and I had an inspiring time in Oslo last weekend, undertaking an invigorating dash through some of the principles and activities at the heart of Write an Opera. On Saturday morning, we met the group of 25 Norwegian teachers and arts professionals for the very first time. By noon on Sunday, they had created a mini opera telling the story of a memory stick that holds the secret to eternal happiness! I salute them all for their willingness, enthusiasm and talent. Congratulations to Eide School for their 10th Write an Opera anniversary and to our colleagues at Den Norske Opera og Ballett for producing such a stimulating weekend of activities exploring Write an Opera. We will continue our support for young people’s creativity and learning through Write an Opera, in England, Norway and beyond, over the coming months and years.